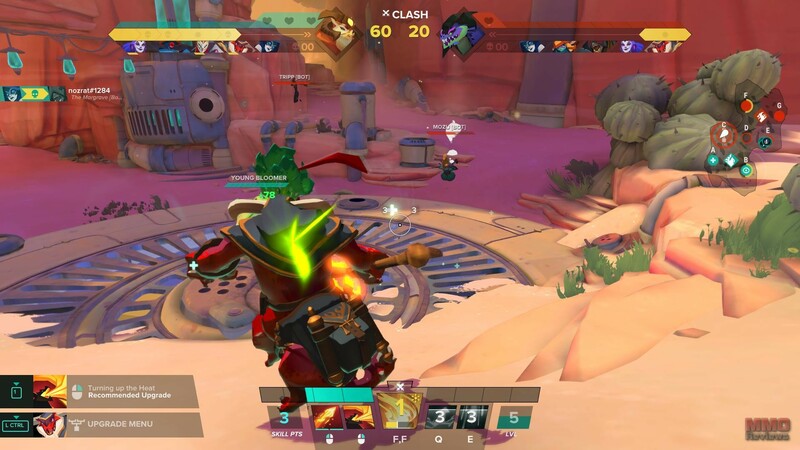 Gigantic is a blend of classic MOBA, brawler and FPS depending on the type of class that players choose and the types of strategy they try to utilise in the game. The core objective in this 5 vs 5 PvP arena battle is for players to power up their Guardians, the gigantic AI controlled boss that fights for their respective team, as they slowly make their way across the arena for a final battle against each other known as the Clash. Using strategy, infiltration and aggressive combat tactics players will ensure that there Guardian is the strongest when reaching the final showdown. The battle is centred on the Guardians, monumental creatures that whilst attackable are more than any mere mortal can take down and requires the teams own Guardian to fell this mighty creature. Over the duration of the game the Guardians will move from their end of the map and gravitate towards the centre of the arena in preparation for a huge showdown known as the Clash; as they move across the map they will disturb and disrupt the physical terrain of their area permanently changing and destroying it. Until the final showdown players will be working towards powering up their Guardian to ensure it is combat ready when it meets its enemy, which can be done in multiple ways. First and foremost by killing enemy teammate’s players will gain power for their Guardian, similarly they can try to sneak past enemy defences into their base and directly attack the enemy Guardian to steal power from it by attacking its heart. Finally there are various strategic points around the map that players must battle for as secondary objectives, that as well as boosting the power of their Guardian can also aid the players directly. Once the Clash begins there is no more strategy, no more infiltration, and just an all-out fight between the two teams as the Guardians and their mortal allies go to-to-toe. At the strategic points players are able to summon a variety of different creatures, which will help defend areas and support allies that will directly give them benefits, boosts and buffs to make them stronger against their rivals. Also as players make kills and perform objectives, gaining XP through the battle, they can earn Skill Points that they can spend on their various class skills to increase their effects and overall power.